Delaware, Ohio (USA) -- In the 122nd annual Merrick Lecture on April 13, Lori Meeks said the role of women in Buddhism is both complex and multi-dimensional. Meeks is a professor of religion at the University of Southern California. When talking about women in Buddhism, Meeks said she chooses her words carefully. "I use the word androcentric [male centered] instead of misogynistic because Buddhism doesn't necessarily show a hatred of women; it is just centered on men," Meeks said. She said there are three things scholars usually focus on when talking about women in Buddhism. They are: the five hindrances, the thrice following and Henjo nanshi. The five hindrances is the idea that there are five ranks in the Buddhist cosmos that cannot be attained through the female body. Buddhists believe they are continually reborn. Thus, they want to attain good karma to reach the status of Buddha. They believe the female body is incapable of this. Thrice following or three obediences state women have to submit to and obey men all throughout their lives. There are three periods of obedience. A woman must obey her dad, husband and son. This idea is expressed in ancient texts. Henjo nanshi is the transformation of female bodies into males. Since Buddha cannot be attained in the female body, women need to transform to the male body, through arduous efforts and male priest oversight, to become a Buddha. Meeks referred to a book called Hokke metsuzaije engi (Origin Story of the Lotus Temple for the Eradication of Sins). The book is about the Hokkeji Lotus Temple in Nara, Japan that was founded in the eighth century and revived in the 13th century. She said the book doesn't focus on the main three concepts, but shows the nuns of Hokkeji's insights instead. "The text offered an unexpected view between women and Buddhism in pre-modern Japan," Meeks said. "The story of Hokkeji nuns is how women found meaning in a culture full of androcentric doctrines that privileges men." The nuns had a much greater impact in the Buddhism culture than people realize, according to Meeks. "I'm trying to show that, through their work connections and organizational efforts, women had a large administration role in reviving this place," Meeks said. "They were autonomous and attracted their own patrons, not acting under male authority." Meeks said Priest Eison (1201-1290) headed a movement to revive Vinaya (monastic law school of Japanese Buddhism that sought to revive monastic law). The movement was popular among priests. Japan was suffering war and natural disasters and Eison believed if Vinaya were practiced correctly, it would benefit Japan as a nation. He and his disciples thought monastic order was not complete because there were no women. According to Meeks, they had no choice but to begin ordaining women. Since women wanted to be ordained, these two interests converged. Meeks said women were looked at in three ways: as temptresses, mothers and potential men. Eison said that, of all the multitude of weaknesses a priest could encounter, weakness of women was most great. He was not trying to discourage women from the Buddhist path, but to keep his priests devout. Women were also seen as compassionate mom figures. Eison said one of the roles of the priest was to aid in the salvation of mothers. Male priests are responsible for salvation of all women. Men are the saviors and women are to be taken care of. Because the female was inferior to the male, women needed to overcome their "sins." Through faith and discipline, obstacles of the female body could be overcome to become a man. This was the view of women as latent men. 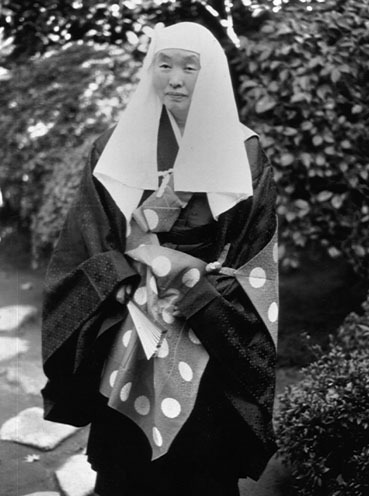 Meeks referred to key Japanese terms and primary texts from sermons throughout her lecture. A handout was given to everyone who attended the lecture to help him or her follow along. In 1257, Eison's disciple Soji said being born a woman was bad karma and that all women needed to be transformed into men. Meeks said this was a common belief. "The female state could be overcome through a nonphysical change in this lifetime," Meeks said. "Lesser beings [females], with the help of male priests, could be brought into the monastery as quasi men." Meeks said the texts of the priests and the texts of the Vinaya nuns depict very different pictures. The women simply ignored the androcentric rhetoric. The priests created a hierarchy where men were higher than women. Eventually, women were included in the ranks of Buddhist men, but not as equals. Freshman Ellie Feely said she enjoyed the religion lecture by Meeks. "I thought it was interesting after I got used to hearing all of the unfamiliar Japanese names," Feely said. Freshman Jennifer Wallace said she also liked the lecture, even though she would have appreciated having more of a background in Japanese culture. "I thought it was an interesting topic and I wish I had known more background information before I came because I did not know much about Buddhism," Wallace said. This was the 122nd Merrick Lecture, making it the longest-running lecture series at OWU. Frederick Merrick, a former professor, founded it in 1889. Lectures about religion occur annually in his honor.